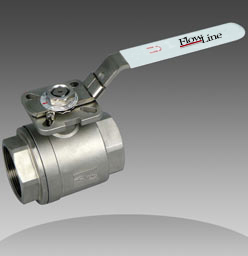 Flow Line Series 61DM ball valves have the following features: Size range 1/4” to 4”, ISO 5211 mounting pad, 2 piece investment cast stainless steel body, blow out proof stem, full port, NPT threads, and live loaded packing for high cycle operation. The Series 61-DM can be fully automated throughout its size range, by either pneumatic or electric actuators. Flow Line’s extensive automation capabilities are due to the fact that we developed our actuator and accessories from the ground up. Our automation products were designed with the torque needed to be able to automate all Flow Line valves. Because all Flow Line valves are kept up to the latest ISO 5211 standards, there is no need for brackets and couplers when using Flow Line actuators on Flow Line valves. We give you a single source for quality automation packages.